In a solar system far, far from the sun, there was a giant ringed planet. Around that planet revolved five moons: Roa, Suti, Serath, Julta, and Cor. The largest of these was Cor, on which intelligent life existed. On Cor there was a man named Andar who had three friends: Bortus, Sorn, and Cyro. One day the four men were looking up at the daylight sky. In that sky they could see the four other moons of the giant ringed planet, none of which had been explored by anyone. “I hear the sound of a hundred trumpets blaring in my soul,” said Andar. “And they are telling me: go and explore that moon in the sky.” Andar pointed to the moon Roa. The other men thought this was a mere flight of fancy, but Andar, a natural leader, soon convinced them he was absolutely serious. Andar persuaded the other three men to join him in a bold attempt to be the first people from their moon to journey into space. The men spent years raising funds for a spaceship. No government wanted to support this project, but the men were able to raise the money from private citizens. When the spaceship was completed, the men named it Fearless. The four men entered into the spaceship and set off for the mysterious moon Roa. Roa was a frigid moon, and the men hoped that when the landing vehicle of their spaceship landed on Roa, it would land on a big solid plane of ice. But as the landing vehicle approached the surface of Roa, there was a terrible surprise. As the men got very close to the surface, they found that what they had thought was a solid ice surface was really like a bathtub with twenty small ice cubes floating in it. Almost all of the surface of the moon was really icy water, and there was only an occasional small patch of solid ice. “We're going to sink into the icy water!” yelled Bortus. “I got this,” said Andar calmly. He landed the landing vehicle on a small chunk of ice. Wearing a spacesuit, Andar then left the vehicle and went out to the edge of the ice chunk on which the vehicle had landed. He got ready to plunge into the icy water to search for signs of life. But the intrepid Andar went ahead and jumped into the water. He spent hours swimming in the icy water, and photographed many strange forms of aquatic life. Finally he returned to the landing craft. The landing vehicle then blasted off and returned to the Fearless, which then took the four men back to their home moon of Cor. The four men were hailed by all as the first heroes of space. They had proven that Cor was not the only place in the universe where life existed. For a few years the men basked in the glory of this triumph. But then one day Andar, Bortus, Sorn, and Cyro were all together outside, and Andar looked up at the sky. “I hear the sound of a hundred trumpets blaring in my soul,” said Andar. “And they are telling me: go and explore that moon in the sky.” Andar pointed to the moon Suti. The other three men joined Andar in the second great expedition. After years of preparation, the four men blasted off in the Fearless, aiming to land on a very different type of moon. Suti was a fiery moon where many volcanoes poured out burning red lava. As their landing craft approached the surface of the moon, it looked for a while as if the craft would sink into molten lava. “We're going to burn to death!” howled Bortus. “I got this,” said Andar calmly. He landed the landing vehicle on a little island of solid rock, surrounded by red fiery lava. Using a small telescope, Andar saw that 100 meters away in one direction was a hill, and on that hill were some glistening minerals. “We should go explore that,” Andar said. “But the gravity of this moon is so weak, I should be able to do it,” said Andar. Then he performed the daring set of leaps. On the hill Andar discovered a treasure trove of priceless exotic jewels. The landing vehicle then blasted off and returned to the Fearless, which then took the four men back to their home moon of Cor. The four men were again hailed by all as great heroes of space exploration. The jewels they discovered were made the main exhibit at a famous museum. For a few years the men enjoyed the glory of their second triumph. But then one day Andar, Bortus, Sorn, and Cyro were all together outside, and Andar looked up at the sky. “I hear the sound of a hundred trumpets blaring in my soul,” said Andar. “And they are telling me: go and explore that moon in the sky.” Andar pointed to the moon Serath. The other three men joined Andar in the third great space expedition. After years of preparation, the four men blasted off in the Fearless, aiming to land on a very different type of moon, the moon Serath. Serath was a flat, dry, rocky moon where it was perfectly safe to land. 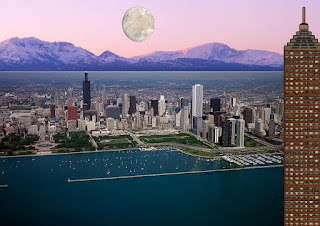 The main danger of the moon was its very frequent earthquakes. Andar landed the landing vehicle on Serath with no difficulty. Almost immediately after landing, the three members of the landing party felt a seismic tremor. 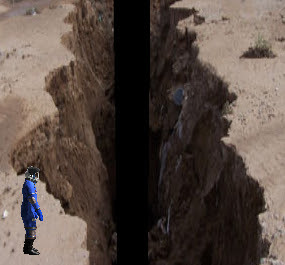 Andar decided to go exploring the rocky surface with Bortus and Sorn. The surface of the planet had deep crevices, narrow faults formed by geological processes that had split open the rock surface. Andar had the theory that at the bottom of those crevices, life might exist. Andar went to the edge of a crevice, and tied a rope around his waist. He requested that the other two men hold the rope. Andar was going to lower himself down into the crevice. “I got this,” said Andar calmly, and lowered himself down into the crevice. Lowering himself fifty meters deep, he reached the bottom of the crevice. They felt another tremor. “Come up now!” cried Sorn. “No, I have to look for life down here,” said Andar. Finally after hours of exploration at the bottom of the crevice, Andar found the life forms he was looking for. After photographing them and taking some biological samples, he asked the others to pull him up to where they were, at the top of the crevice. The tremors got worse, and the men hurried back to their landing craft. Feeling a full-scale earthquake starting, they lifted off from the moon, and entered into orbit, where they docked with the Fearless. The men then happily returned to their home moon of Cor. After returning home and touring their homeland to the greatest acclaim and applause from their admirers, Andar, Bortus, Sorn, and Cyro decided they were now too old to go on any more space missions. They had once dreamed of exploring the last unexplored moon in the sky: Julta. But they knew that moon was more dangerous than all the others, so they gave up that dream. After writing a book which made them much money, and after going on a long speaking tour, the four men retired to a home for the aged. They received many visitors who asked them about their exploits. The four old men sat one day in the garden of their old folks home. Then Andar looked up at the sky with a facial expression he had displayed three times before. “No, I am not,” said Andar. “This time I hear the sound of a thousand trumpets blaring in my soul. And they are telling me: go and explore that moon in the sky.” Andar pointed to the moon Julta, the one moon none of them had set foot on. In a frenzy of excitement, Andar started barking out orders and encouragement. The brave old men were all persuaded to go on one last mission, to the most dangerous moon of all, the mysterious unexplored moon Julta. Somewhere in their minds they all suspected that their previous luck would not hold, and that they would end up freezing to death in icy waters, or burning up in a river of lava, or crashing into a mountain. But they also knew in their hearts and their bones that they had to go on one last voyage into space. 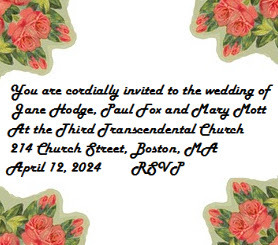 Marriages of the Future: More Permutations Ahead? I have a suspicion that (for better or worse) there are still additional permutations coming. Let me explain why I suspect this. Yesterday there was a news headline: UK may approve creating babies with DNA from 3 people. The story was about an exotic genetic technique that could be used so that certain couples with a genetic problem might have healthy children by having doctors splice in additional genes from a third person. Now let's imagine if this process were to be legalized. The door would be open to cases of entirely healthy parents combining their genes with genes from a third person. Let's imagine Karl Karrington has some special genes that cause him to be a brilliant scientist or athlete. It might then be that John Doe and Jane Doe arrange to have some of Karl's genes spliced into the genes of their developing embryo, to improve the chances that their child will be a brilliant scientist or athlete. The result would, in effect, be a child with three parents. The child would be sharing the genes from three people. Now if the world starts seeing children with three parents, what can you imagine will happen next? I imagine the next step would be a demand for a legalization of polygamy. Think of it: John Doe and Jane Doe go on television and tearfully plea: why can't we marry Karl – he's one of the fathers of our child. If the idea of legalized polygamy sounds outrageous, I may note that it is no more outrageous than the notion of gay marriage seemed thirty years ago. There have already been cultures in which polygamy was accepted. Al Kent had developed the strangest plan ever created for getting rich. Al had got his idea while doing medical research on cryonics, which is the science that deals with preserving humans and animals at low temperatures. Al had worked for a large bioengineering company that was trying to develop medical techniques that could be used to put very sick patients into a deep cold sleep, until their condition had stabilized and a plan could be developed for treating them. Part of Al's job had been developing experimental techniques that could put animals into a deep, cold, cryonic sleep. The company had hoped that these techniques could one day be used to help save sick humans. After a month of making particularly good progress on this task, one day Al had come home and thought to himself: what would it be like for a human patient to go into a cold, deep sleep for thirty years, and then wake up? After considering various ramifications, it had occurred to Al that this type of long deep sleep would be a great thing for the person financially. Because of what is called “the magic of compound interest,” Al calculated that if a person had $100,000 in an investment account earning 6%, and left the account untouched for thirty years, at the end of the thirty year period the investment would be worth about $574,000. Then Al had thought to himself: wait a second, what if I did that myself? The scheme had then hatched in his mind: he could use his company's cryonic technology to put himself into a long, deep, cold, cryonic sleep. He could sleep for thirty years, and when he woke up, he would be rich. His investment portfolio would grow to a level of wealth about six times greater than when he started. At first Al just kept this idea in his mind as a pleasant fantasy. But then he started to think about it more and more seriously. When Al had experimented with inducing cryonic sleep in animals, he had found that the long, deep sleep seemed to slow down their aging process by about 70%. Al concluded that if he went into a thirty year cold, deep sleep, he would wake up looking only about ten years older. Being only 33 years old, Al figured that he could go into a cryonic sleep for thirty years, and wake up looking only only about 43 years old. One day Al was watching a television show called Revels of the Filthy Rich, and he looked with envy at the big, beautiful houses and shiny cars and exotic vacations of the people on TV. He decided right there and then to put his radical plan into effect. Al bought some land in a remote area of the woods. He arranged for contractors to build an underground house there. He arranged for other contractors to install a fence around the house, and to install solar panels that would provide an uninterrupted power supply. Then one day Al took a bunch of equipment and experimental drugs from his company, the same things he had been using to put animals into a long, cold, cryonic sleep. Al left a stack of fifty dollar bills to pay for the things he had taken. He took the equipment and experimental drugs to his underground home. Using a combination of items he had taken from his company and items he had developed at home, Al set up a cryonic sleep chamber designed to keep him in a cold, deep sleep for thirty years. The chamber would be powered for 30 years by the solar panels connected to his house. Al set up a mechanism designed to slowly feed an experimental drug into his body by means of an IV drip. The drug would help slow his metabolic processes, so that he would not need food. Al set up another mechanism designed to occasionally supply a tiny amount of water to his body. In preparation for his cryonic sleep, Al had gained seventy pounds. 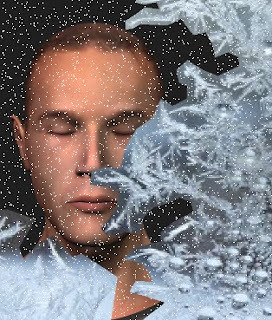 He calculated that given the extremely low rate of metabolism he would have during his cold, cryonic sleep, his extra seventy pounds would be enough to last him for the next thirty years. Just before sliding into the cryonic chamber, Al took a look at his investment portfolio. He was worth about $170,000. He figured that when he awoke thirty years later, he would be a millionaire. Then Al pressed some buttons on his chamber, and went into a long, deep, cold, cryonic sleep. Thirty years later, the chamber's timer went off, and Al awoke. He slowly climbed out of his cryonic chamber. He looked at his body. He had lost about 90 pounds. But since he had gained 70 pounds before entering into the chamber, he looked pleasantly thin. Al immediately thought: what is my portfolio worth now? He grabbed his cell phone and tried to call his investment bank. But the phone was dead. Of course, thought Al; the phone bill hadn't been paid in thirty years. Al then decided to go visit his investment bank face to face. He jumped into his car, and held his breath when turning the key. He was surprised to find that he was able to start the car. Al drove into the nearby city, and parked his car on the street. He marveled at all the strange looking futuristic cars he saw on the street. He then walked to his investment bank, and asked to see an investment specialist. “My name's Al Kent, and I need to check on the value of my portfolio,” Al said. The investment specialist complained that the company had not heard any word from Al in thirty years, and demanded some proof of his identity. Al produced the proof. “Well, looking at our records, I see here that your investment portfolio is now worth $1,156,234,” said the investment specialist. Al walked out of the bank, and decided to get some food. He hadn't eaten in thirty years, and now that his metabolism was back to normal, he had regained a healthy appetite. Al walked into a small convenience store to buy something to eat. Al picked up a sandwich, and looked at the price: $347. Al thought to himself: what kind of a joke is this? Some computer must have goofed when printing the price tag, he thought. Then Al checked other items at the store: a cup of coffee cost $115, and a can of beans cost $120. Al thought to himself: what kind of a psycho store is this? He left the little store, and went to a large supermarket across the street. Al checked the prices. A head of lettuce cost $95. A loaf of bread cost $249. A gallon of milk cost $429. Nowhere in the supermarket could Al find anything that didn't seem to be a hundred times more expensive than he expected. Al walked out of the food supermarket, stunned. He sat down on the street curb, and asked himself: how could this have happened? Then finally he figured it out. During his thirty-year cold, deep, cryonic sleep, Al's portfolio had grown at an annual rate of about 6%. But during that time the average inflation rate had apparently been much higher than 6%. So now Al was a millionaire, but his million dollars wasn't worth the same as a million dollars in 2013. It was worth something much, much less. Using the prices he had seen, Al did some math in his head to estimate how much his million dollar portfolio was worth in 2013 dollars. He calculated that his portfolio was now worth about $10,000 in 2013 dollars. Al was a millionaire, but his net worth had really dropped more than 90%. Instead of getting six times richer, he had gotten ten times poorer. With everything being a hundred times more expensive, Al would be lucky if his money lasted him another six months. After figuring this out, Al was so sad that he bought himself a six-pack of beer to drown his sorrows. The six-pack cost him $835. Because of other more urgent threats to our existence, defending the Earth from a possible attack by an extraterrestrial invasion is not a high priority. Until we get rid of the thousands of nuclear weapons on our planet, the likelihood of us blowing ourselves up is much greater than the chance of some aliens doing that. But imagine it is the year 2100, and man has removed the most urgent short-term threats to his existence, by solving the problem of global warming and eliminating the threat of a nuclear holocaust. We might then look at reducing the long term threats to mankind, including the threat of an alien invasion. What technologies might we use to defend ourselves from an alien attack? Below is a list of some of the technologies that could be used. A defensive space ship is probably the first thing that comes to most minds when they think of defending Earth from alien attack. It is easy to imagine a space ship armed with some kind of laser cannon or guided missiles or even conventional cannons. Such a ship could move close to any invading alien ship, and launch an attack against it. However, such ships might not be the most effective way to defend the planet. The hot rocket exhaust of a spaceship gives off an infrared signature that would be very easy for any invading alien ship to detect. It would probably be very easy for an alien space ship to detect some other ship that was approaching it, and launch a counterattack that would stop it. This type of defensive weapon would be easy to construct using technology only slightly different from existing intercontinental ballistic missile technology. Instead of traveling from continent to continent, the missiles would travel from the ground to an orbit around our planet. The missiles would be designed to blow up a nuclear bomb near an alien spacecraft that had started to orbit our planet. The weakness of this technology is that the hot rocket exhaust of such a missile would give off an infrared signature that would be very easy for an alien ship to detect. So an alien ship might be able to detect the missile's launch, and blast the missile into pieces while it was rising through the atmosphere. There is currently a treaty that prohibits placing nuclear weapons in orbit. But if that treaty could be modified, we could put into place a simple and reliable system of planetary defense by placing a host of hydrogen bombs at various different orbits around our planet. If we were then attacked by an alien ship, we could simply send a radio signal causing the satellite bomb closest to the ship to explode. That would give no warning, and would therefore be hard to defend against. 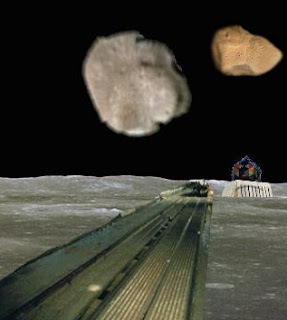 According to the wikipedia.org article on mass drivers, “A mass driver or electromagnetic catapult is a proposed method of non-rocket spacelaunch which would use a linear motor to accelerate and catapult payloads up to high speeds.” Mass-drivers were originally conceived as a way of catapulting lunar materials towards the earth, to provide materials that could be used in the construction of space colonies. Robert Heinlein in his novel The Moon is a Harsh Mistress imagined that a lunar colony rebelling against Earth could use a mass-driver to pummel the Earth with rocks that would strike our planet with a devastating kinetic energy. It is easy to imagine lunar mass-drivers that would serve as defensive weapons to attack invading alien ships. The mass drivers would shoot a hailstorm of small rocks at any ships that were trying to orbit our planet. A mass-driver might be able to launch hundreds of rocks every minute. Each one would hurtle through space with enough kinetic energy to cripple an alien spacecraft. Even if the ship had some kind of defensive technology, or “hull breach sealing” technology, it might not be able to defend against an onslaught of hundreds of rocks being propelled every second from a large group of mass drivers on the moon. Just as it would not be very hard to construct a mass-driver on the moon, and turn it into a weapon for destroying invading alien ships, the same technology could be employed on near-Earth asteroids. Imagine an alien ship has reached orbit around Earth. The ship detects an asteroid coming within 20 miles of our planet. This seems like nothing to worry about. But then suddenly the asteroid starts shooting a hailstorm of small projectiles aimed at the alien ship, and a similar rocky hailstorm shoots out over and over again. That type of ambush would be very hard to defend against. Another possible weapon against alien invasions would simply be an asteroid that had been hollowed out and filled with one or more nuclear bombs. Such an asteroid could be discreetly provided with a propulsion system, which could be created either through a small rocket or a mass driver designed to produce a propulsive effect, in accordance with Newton's Third Law. If a hostile alien ship appeared, the asteroid could be ordered to approach to within a certain number of miles of the ship, which might attract no attention, as it might appear to be a natural motion. The asteroid could then ignite its nuclear weapons, destroying the alien craft. Powerful as they may be, the types of weapons mentioned above all would travel much more slowly than the speed of light, possibly allowing an alien ship some chance of defending against the attack. For the purpose of an ambush, the most effective weapon would be one that operated at the speed of light. One such weapon would be a powerful laser beam weapon. Such a weapon might be hidden on the surface of the moon. A laser beam weapon shot from the moon would give an alien ship orbiting Earth only two seconds to defend itself. That would be pretty much the ideal ambush. Do we have any of these types of weapons now? No. We are sitting ducks, ripe for conquest. So if you ever look up in the sky and see a star in the sky far brighter than any you have ever seen before, you had better say your prayers that the arriving visitors mean well. It all happened in a single week: an extraterrestrial spacecraft was seen in orbit around Earth; a smaller craft was seen traveling from the spacecraft to the surface of Earth; the smaller craft deposited a huge metal sphere onto the surface of an Arizona desert; the smaller craft returned to the main extraterrestrial spacecraft; and the spacecraft then sped away out of the solar system. 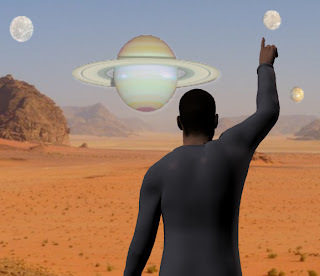 At the White House the President of the United States talked with his advisers concerning what to do about the strange alien sphere in the desert. 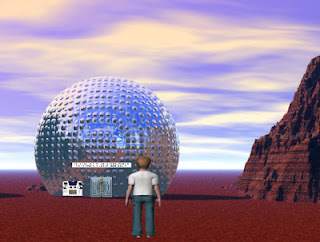 A long list of brilliant minds went to the alien sphere in Arizona, and each tried to solve the puzzle, so that the doors of the sphere could be opened. One was a Harvard PhD in Applied Mathematics. Another was the most successful 3D game designer in Silicon Valley. Another was a man who had won $500,000 on a TV game show called Puzzle Mania. Then there was the author of the most widely used textbook on computer graphics. Then there was an astronomer from Cornell University, who held the chair once occupied by Carl Sagan. Then there was the most brilliant mind used by the military to crack the codes used by foreign governments. The brilliant minds were able to figure out the basics of how to use the puzzle interface, how to position the 3D objects in space, and control their motion and trajectory. Some of the geniuses were able to use some of the puzzle pieces to assemble a scene, such as a bird flying around a house. But none of them was able to make use of all of the 3D puzzle pieces. It was as if they had taken some of the pieces of a jigsaw puzzle, and assembled a little scene, but had still left most of the puzzle pieces unused. But there was one person who was convinced he could solve the puzzle. The person was a boy named Waldo Shrumpdinkel, who was ten years old. Waldo was a funny looking kid, with red hair, a face full of freckles, and a gap between his front teeth. From the time he was three years old, Waldo had always loved to play with Lego blocks, that toy consisting of little plastic blocks you can connect together. Waldo would even play with his Lego blocks when he was riding on the school bus. The other kids gave him the cruel nickname Lego Boy. In the hallways of his school, Waldo would get taunts such as: here comes the Lego Boy, have you got some Lego blocks for me, Lego Boy? While studying the alien puzzle online, Waldo became convinced he had the solution to the puzzle. So he insisted that his parents take him to Arizona, so he could give the puzzle a try. After much arguing, they finally agreed. So Waldo approached the alien sphere in Arizona, which was guarded by a platoon of soldiers. Waldo approached the alien sphere. Going up to the puzzle interface next to the door, he began trying his solution. Somehow Waldo had been able to see the puzzle solution in his mind, which had been sharpened by thousands of hours of Lego practice. Using the interface panel, he assembled half of the puzzle pieces into a shape that matched the shape of the extraterrestrial spacecraft that had appeared orbiting Earth. He assembled the other half of the puzzle pieces into a shape that resembled a ringed planet. 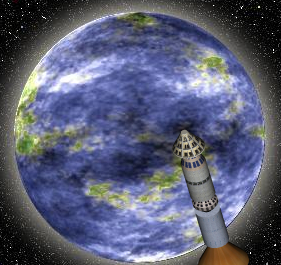 Then Waldo used some of the interface controls to make the spaceship shape start revolving around the planet shape. A strange loud noise came from the alien sphere. The doors at its base opened. Waldo ran into the sphere through its open doors. “Follow him!” yelled the platoon leader. Some soldiers also tried to enter the sphere, but before they could enter, the doors closed. Then for ten long days, there was no sign of Waldo. The doors of the sphere stayed closed. A huge crowd assembled around the sphere, waiting for Waldo to come out of the sphere. Waldo's parents were worried that he might have no food or drink inside the sphere. Finally after ten days there was a loud noise from the alien sphere. The doors of the sphere opened. Waldo walked through the doors, and approached a crowd of reporters and television cameras. As billions watched on television, the whole world waited breathlessly for what the little boy would say next. Then he began to speak. The long era of human history known as the Atomic Age had now ended. The next seventy years of human history would be known by all as the Age of Waldo Shrumpdinkel. Can Nearby Aliens See a Triple Sunset? Can Nearby Aliens View a Triple Sunset? 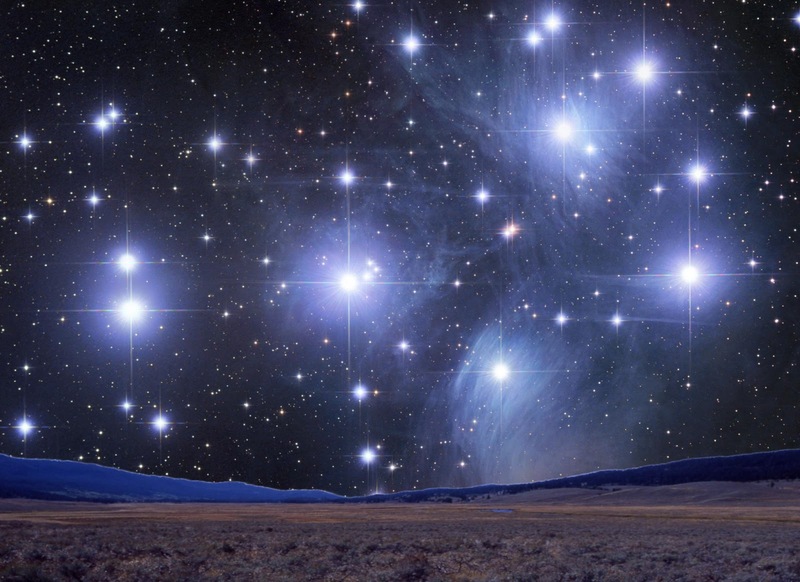 On Saturday I put up on this blog a post entitled “Where is the Most Beautiful View in the Universe?” I imagined nine types of views that can be considered candidates for the most beautiful view in the universe. One of the nine types was: The View From a Planet Orbiting a Binary Star. I depicted a planet where one could view a double sunset. But the universe has a way of surpassing our wildest imaginings. Today it was announced by scientists that in a nearby star system there are 3 “super Earth” planets in the habitable zone where someone might be able to view not just a double sunset, but a triple sunset. The star is Gliese 667C, which is only 22 light years away, pretty much in the back yard of our sun (the nearest star is a little less than 5 light years away). Astronomers have discovered three “super Earth” planets in the habitable zone of this star. The habitable zone is the region of a solar system that is neither too hot for liquid water to exist, nor too cold for liquid water to exist. Each of the planets is a few times larger than the Earth, and life and water might exist on any one of them. This star Gliese 667C is actually part of a triple star system, the other two stars being Gliese 667B and Gliese 667A. The three stars rotate around each other, but the three super-Earth planets of Gliese 667C revolve around just that star, rather than the whole triple system of stars. Since the three super-Earth planets of Gliese 667C are in the habitable zone, and are not too large to preclude the existence of life, there seems a quite real chance that life may have evolved on one of the planets. 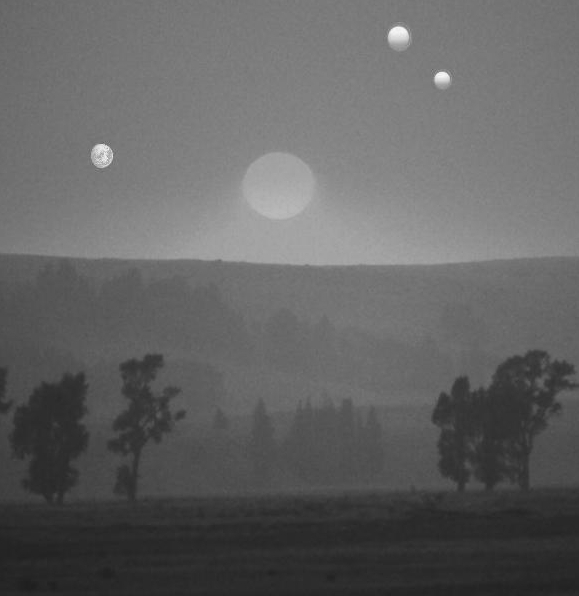 An observer on such a planet would apparently have the incredible spectacle of being able to see a triple sunset – a sunset involving not one sun, but three suns. 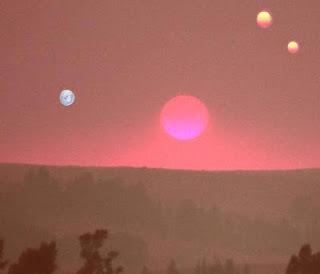 Today's news story came up with an artist's depiction of the view from a planet of Gliese 667C, showing three suns in the triple star system. However, I doubt whether the artist got things rights. 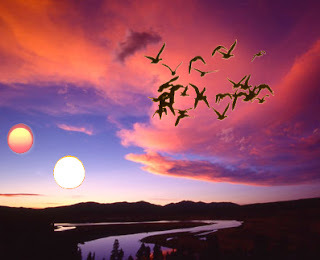 The artwork shows three whitish yellow suns. But Gliese 667C is a red dwarf star, and Gliese 667A and Gliese 667B are K class stars, which means they should have an orange color. Below is my own depiction of the view from one of the super-Earth planets revolving around Gliese 667C, and I think this depiction has the correct color scheme. 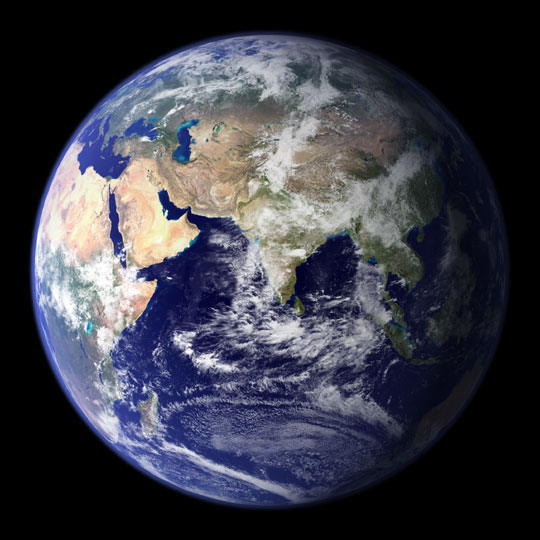 I imagine life existing on the planet, which is consistent with what we know about the three super-Earth planets being in the habitable zone. I also imagine that from one of the super-Earth planets you would be able to see one of the other super-Earth planets, and see just a tiny bit of its features. This is rather plausible given what we know, that these three planets larger than Earth are fairly close to each other. So we have a new candidate for a type of view that would be one of the most beautiful in the universe. When high school student Jerry Tyler took his date to the Senior Prom, he couldn't help thinking to himself: I've lived through this event many times before. Before long the school year ended, and Jerry absorbed himself in the teenage summer fun at his little town: the parties, the informal baseball games, the dates with pretty girls, and the swims at the local pond. In the middle of the summer, Jerry got a letter from his high school saying he needed to repeat Grade 12, because his school grades were not high enough. Next September on the first day of school Jerry sat with his friend Vinny in the school cafeteria. “You must have slipped up somewhere,” said Vinny. Vinny and Jerry spent a while trying to remember as far back as they could. After their recollections, they came to the conclusion that this was their tenth consecutive year as senior high school students in Grade 12. The kids were told several times that the school principal Mr. Jones was too busy to talk with them. Finally they waited outside the principal's office until the end of the day. When the principal was locking his office, the kids demanded to talk to him. They explained how puzzled they were about repeating Grade 12 year after year for ten straight years. Mr. Jones brought the kids into his office, and confessed a secret. “What is it?” asked Jerry. “Yeah, right,” said Jerry incredulously. Jones took his fingers, and in an instant he moved them close to Jerry's eye, as if he were trying to grab the wings off a fly an inch from Jerry's eye. “I still don't believe you,” said Vinny. “Check your friend's pulse,” said Jones. “Then let him check your pulse.” They both tried, and found no pulse. “So if that's true, then what happened to the people, the regular humans?” asked Jerry. “So that's why we've been repeating our senior year over and over again for ten years?” asked Jerry. The two boys met Jones the next day, and they set out on the road in his car. They passed by a town with a run-down look, including some buildings with graffiti. They kept on driving, and passed by an ugly-looking community surrounded by a high fence with barbed wire. Finally Jones drove to a lovely ocean-front community. There were many beautiful beaches, on which strolled a host of bikini-clad young android women and muscular young android men. “Fantastic!” exclaimed Jerry. “Cool,” said Vinny. Where is the Most Beautiful View in the Universe? It is easy to come up with a list of the most breathtaking views on planet Earth, adding items such as the view from the Empire State Building, the view from the Eiffel Tower, the view from the rim of the Grand Canyon, the view from behind Machu Picchu, and the view from Yosemite Valley. But let's think bigger, and ask: where is the most beautiful view in the universe? We cannot specify one particular place, but we can at least consider different types of cosmic vistas, and ponder which type is the most beautiful. Here is a list of types of vistas that are as likely as any to contain the most beautiful view in the universe. One plausible candidate for the most beautiful view in the universe is simply the view from a space station above any life-bearing planet. Someone in a space station above a planet like Earth can enjoy a most glorious spectacle of color and motion. At such a spot the rotation of the planet and the swirling motion of the clouds means you almost never see the same sight below you. Before long we will have space tourists who will spend a million dollars or more mainly just to enjoy such a view for a short time. 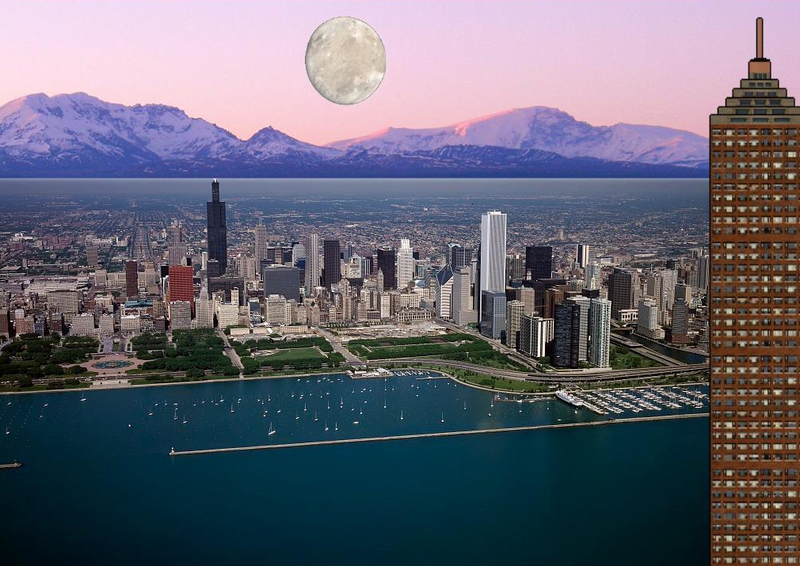 The moon in the sky of our planet makes a great contribution to the beauty of our sky, but imagine what it would look like if the moon were ten or twenty times bigger in the sky. Then imagine that the moon had rings around it. 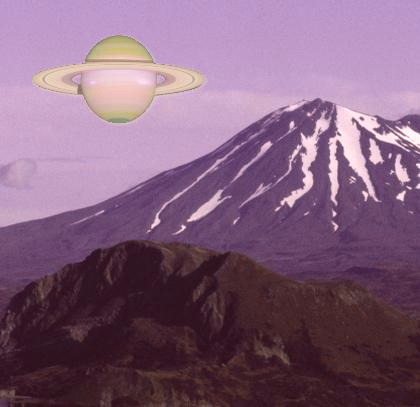 That is pretty much what the view would look like if you were on the moon of a ringed gas-giant planet such as Saturn. Below is how such a view might look like. Since we know that Saturn's moon Titan has a thick atmosphere, the depiction is that of a moon with an atmosphere. For me the most unforgettable moment in the first Star Wars movie was the moment when Luke Skywalker on the planet Tatooine views a sunset involving not just one sun but two suns. Scientists have actually discovered two real world planets like Tatooine: Kepler 34b and Kepler 35b. Each revolves around two different stars. Below is a look at how a sunset might look on such a planet. Within our galaxy of more than 100 billion stars there are numerous star clusters called open clusters, areas where stars exist in much greater numbers than they do near our sun. Around the sun there is about one star every five light years, but within an open cluster there might be a few hundred stars within an area only 30 light years across. The view from a planet near such an open cluster would be breathtaking. You might look up in the sky and see several stars as bright as the moon is in our sky. Since these types of clusters are right here in our galaxy, we have reason to suspect that many intelligent beings may have enjoyed such spectacular views from their planets. Here is how such a view might look, from a planet near the Pleiades open cluster. We know that Mount Everest is not the tallest mountain in the solar system. The Olympus Mons mountain on Mars is about three times taller. So we may presume that in the universe there are many mountains much taller than Everest. You must be able to get some of the most beautiful views in the universe from the tops of such mountains. Below is a depiction of such a view. On our planet the tallest skyscraper is the Burj Khalifa with a height of 829 meters. But within our vast universe, there are probably some races more advanced than ours which have built skyscrapers as high as 5000 meters. The view from such buildings must be astonishingly, overlooking vast futuristic cities. 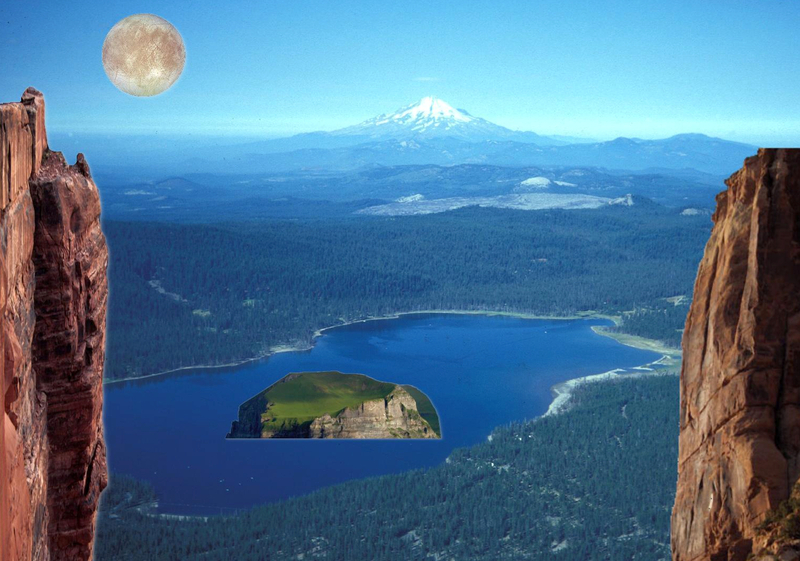 Below is an attempt to imagine the view from such a building on an alien planet, one with a large moon. When a star several times more massive than the sun explodes in a supernova, the star's gas shoots out into space, creating a very beautiful sight called a planetary nebula. 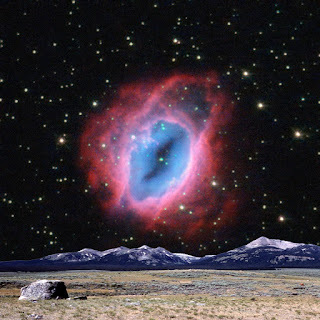 Our galaxy is full of gloriously photogenic planetary nebulae, having a great variety of colors and shapes. A planet near a planetary nebula would offer one of the most beautiful views in the universe. But it probably would not be worth the view, because if you lived there you would be likely to get zapped by cosmic radiation from the supernova. Below is an attempt to visualize the view from a planet near a planetary nebula. 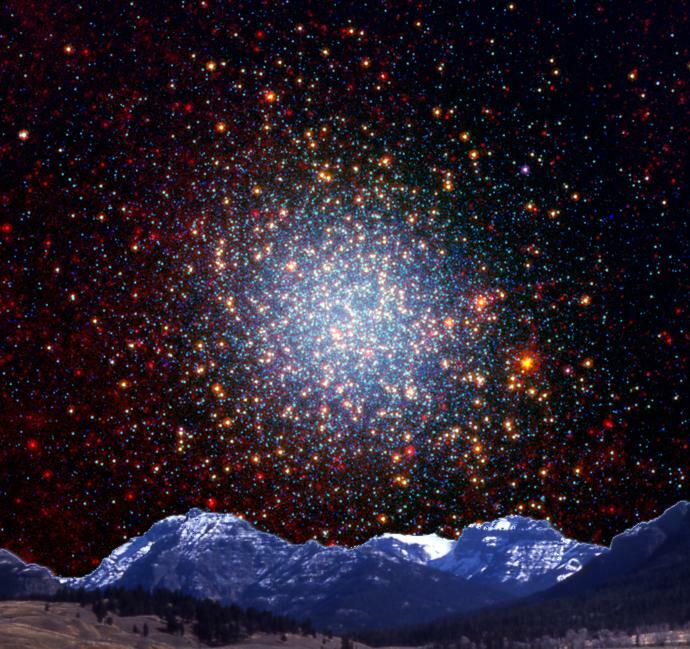 Globular clusters are spherical collections of stars that orbit our galaxy. Globular clusters are believed to be poor in the metals needed for rocky planets, so perhaps we cannot plausibly imagine the view from a planet inside a globular cluster. But we can plausibly imagine a planet revolving around a star on the outskirts of our galaxy, and from such a planet one might be able to see a glorious close-up view of a globular cluster. It might look something like the image shown below. 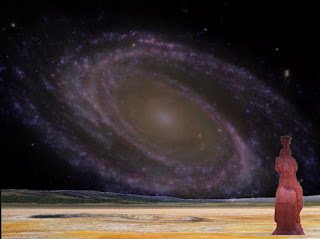 Anyone can see our galaxy from the surface of our planet, a fact that is tragically unknown to many city dwellers. But those who live far away from cities know that all you need to see the Milky Way is to get far away from lights on a crystal clear night, and you will see our galaxy as a faint river of stars in the sky. But imagine the view from a planet on the far outskirts of our galaxy. 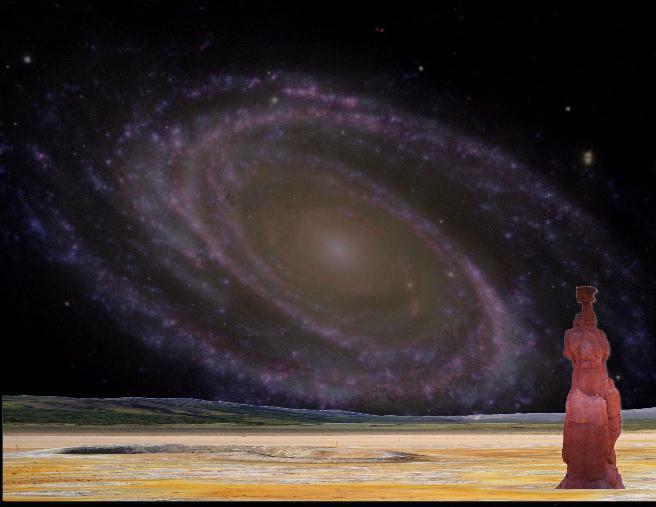 From that planet you would be able to see the full glory of our galaxy, with its swirling spiral arms. Below is an attempt to visualize such a view. Now reader, from this discussion I'm sure you are now well prepared to answer this question: where do you think is the most beautiful view in the universe? Which Jobs Are Most Vulnerable to Automation? Will People Be Happier in the Future? Can Robot Children Help Save the Earth?